Following two remarkably unproductive years, Congress picked up the pace in 2015. More laws were enacted this year than in the first year of any two-year congressional term since 2009, and more substantive laws were enacted than in any first-session year since 2007. As of Dec. 29, Congress has passed 113 measures that have been signed into law, compared with 72 in 2013 and 81 in 2011, according to the Library of Congress’ THOMAS database. (A few more still await President Obama’s signature.) Of that total, we deemed 87 to be “substantive” by our deliberately generous criteria – that is, any legislation other than renaming buildings, awarding medals, commemorating historic events and other purely ceremonial actions. By contrast, the previous two Congresses managed to pass just 63 (in 2011) and 61 (in 2013) substantive laws, respectively. That increase in lawmaking occurred despite a series of well-chronicled battles between Republican leadership and insurgent members, such as the House Freedom Caucus, that eventually led to House Speaker John Boehner quitting his job. But unlike the past two Congresses, which were split between a GOP-led House and a Democrat-controlled Senate, both chambers now are run by Republicans, which may have removed one source of legislative friction. 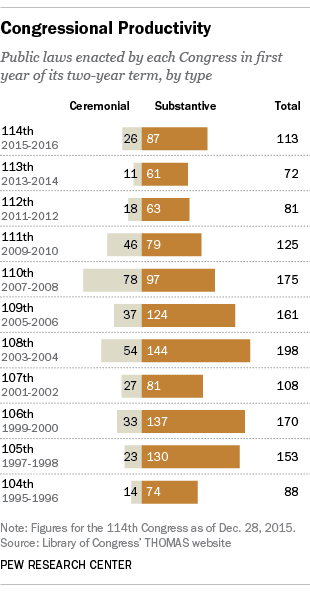 Still, the current Congress lagged far behind the 108th, which enacted 198 laws – 144 of them substantive – in 2003, the first year of its term. So, what did Congress get done this year? One of the final pieces of legislation to clear Congress before the holiday recess was a massive tax and spending deal that, among many other provisions, funds the federal government through September 2016 and extends dozens of expiring tax breaks. Among the other significant acts of the 114th Congress’s first session: the Every Student Succeeds Act, which replaced the No Child Left Behind education law; a five-year funding bill for roads, mass transit and other transportation programs; the USA FREEDOM Act, which scaled back the government’s ability to access Americans’ phone records; and a measure extending presidents’ authority to “fast track” trade agreements, including the controversial Trans-Pacific Partnership deal. Nevertheless, Americans’ views of Congress remain highly negative. In a Pew Research Center survey conducted in September, 27% of Americans said they had a favorable opinion of Congress, versus 69% who said their opinion was unfavorable.